Some of you know my sepsis story and why I spend time working with nursing informatics teams to improve sepsis identification and management with software solutions. Last weekend in Grantsville, Maryland, I had the opportunity to retell my story at the Cinderblocks event. While Cinderblocks will probably never rival HIMSS in terms of the number of attendees, the Cinderblocks gathering is no less important. It was an amazing time of storytelling and planning for the better days of an open healthcare system that actually works for patients and family members. I came away from the gathering inspired and humbled by the patient advocates, activists, and agitators in attendance. I reconnected with old friends and made new ones. Cinderblocks is part of the amazing work of Regina Holliday. I first heard about Regina and her Walking Gallery project back in 2011 when I was serving on the HIMSS Connected Patient committee. I first met Regina in 2012 and we have stayed in touch over the years, primarily through me watching her ministry and activism outreach grow. I had a chance to visit again with Regina at HIMSS18 in Vegas. I mentioned that I always wanted to be a part of the Walking Gallery and Regina did what she does best, she put things into action and challenged me to tell my story and send her a jacket! At the Cinderblocks event, I was able to receive my jacket and officially become part of the Walking Gallery tribe. 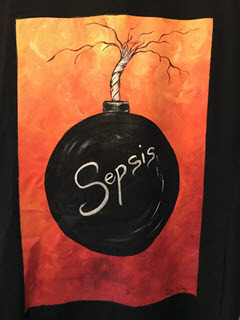 Regina powerfully captured the scary reality of sepsis: the fuse lit in your blood system is short and your life depends on stopping that fuse. I am grateful that quick intervention allowed me to survive the sepsis bomb and I will wear this jacket in the memory of all of those who did not survive the end of the fuse of sepsis. So, if you happen to see me or someone else walking around a healthcare conference with a painting on the back of their jackets, spend a minute to hear their story. Afterwards, reflect on your story and how you can make a difference in someone’s health journey, maybe even your own. You can also learn more about Regina and her story from her book, The Writing on the Wall. If you are attending the 2018 MUSE INSPIRE Conference in Orlando next week, I’ll be presenting a poster on Early Identification for Sepsis Management and wearing my jacket! I welcome the opportunity to hear your story and also learn more about your plans regarding sepsis management strategies.